This is not just a review of "Midnight in Paris". 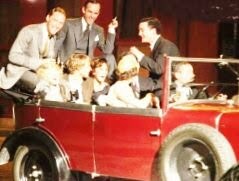 Yes, I did appreciate Woody Allen's dazzling Time Machine, the 1920 Peugeot that whisks protagonist Gil Pender to interwar Paris and then the Belle Epoque. I liked the fairy-tale echo in the Time Machine arriving as a church bell tolls midnight. Also liked the nostalgic dream that Gil (played by Owen Wilson) lives out once he gets into the Peugeot, the vibrant post-World-War-I Paris period when cultural barriers were coming down and the creative community was buzzing. Among his multiple kiss-me-now opposite numbers in his post-midnight life is Picasso's mistress Adriana, played by the sensuous and engaging Marion Cotillard, who is getting bored with 1930s Paris and wants to relive the Gay 90s-Belle Epoque era. One little quibble, since this is a Time Travel blog: "Mr Allen, it's 95 years since Einstein's General Theory of Relativity made travel to the past a theoretical possibility. If you do some more time travel stuff in your next movie could you get us out of the technological jail of the 1895 Time Machine of H.G. Wells?" But this post is not a movie review ("Ceci n'est pas une pipe."). It's about a challenge that I threw out to my wife (40th anniversary this year) Alice, after we were in Paris for several few days. She had been eager to go to Anish Kapoor's Leviathan exhibit at the Grand Palais, and the Odilon Redon exhibit and several others. She was a bit disappointed. Now she proposed we go to another exhibit by an artist she confessed she knew nothing about. "Alice," I said, "what are the odds that you and I are going to love this show? You liked the post-noir Redon, but were really put off by his pre-1890 art. You thought Kapoor's whale was clever but not satisfying. Do you think the less known artists in Paris are better than the less known ones in New York? Is it likely that tomorrow's pantheon of famous artists, writers or musicians will center on the Paris of today?" She replied: "You didn't even go and see the whale." It was true. Alice went early. I had some errands and showed up later. The queue was by then monstrous. I could see from the outside it was a big whale and Alice advised there was nothing really to photograph. So I was dutifully impressed and skipped the exhibit. Does that make me a bad person? "How," I asked, "do we separate gimmick-hustling artists from the true originals? Who on exhibit today is going to be 'immortal through their work' in 20 or 100 years?" "Kapoor is huge in London as well," she offered. Then an idea popped into my head. "Let me propose a challenge," I said. "Instead of standing in line to visit an exhibit by someone we have never heard of, and looking at work we are likely to find disappointing, let's spend half a day trying to pinpoint the locations in Paris where 'Midnight in Paris' scenes were filmed. At least we know that will be fun." Some background here: Alice doesn't always like my ideas. She liked this one. 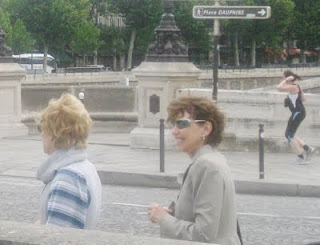 Then our Paris friend and host Edith Paix, who has also seen and enjoyed the movie, asked to be included. So Alice and I set off with our Parisian Sherpa in search of locations. Our first thought was to go to Montmartre, center of Paris arts during both the Belle Epoque and the interwar years, where the Moulin Rouge opened, where Verlaine met Rimbaud in 1872, where Renoir, Toulouse-Lautrec and van Gogh did much of their painting... and where Hemingway hung out with the Fitzgeralds after their 1925 meeting, where Gertrude Stein and Picasso and Dali kept up the buzz, where the music was driven by Cole Porter and jazz, and the Charleston was rapidly imported. But that would be to identify the actual places where the artists hung out, not the movie locations. A different search. 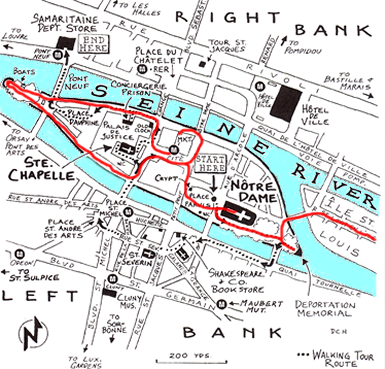 We decided to stick with the original plan and start our Location ID Challenge in the Ile de la Cit�, for two reasons. First, that's where a publicity story about the movie put the location for the filming in August 2010. Second, our French friend Edith said she recognized several shots in the movie as being in the Place Dauphine, at the opposite end of the Ile de la Cit� from the Notre Dame Cathedral. 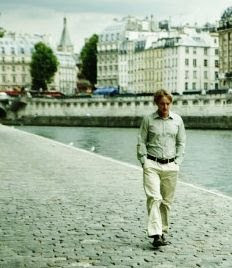 Many of the outdoor scenes with Gil and Adriana are on the road or steps near the Seine. When a familiar landmark is in the background, the location of a shot is kind of obvious to anyone who knows the neighborhood. The shot at left of Gil Pender walking on the banks of the Seine is clearly from the Ile de la Cit�. However, it gets harder when the only identifying background in the shot is a staircase or a road or a wall. There are lots of staircases and ramps in the Ile de la Cit�. So which one is it that Gil and Adriana are on at the right? Note the pattern of blocks behind them. The blocks in the photo at left make a pattern very similar to the one in the location shot above where Adriana is kicking out her foot. In both cases it looks as though a stone archway or doorway was filled in. This occurs at intervals at a different points along the the Seine - we have found the right seat but the wrong pew. Here is another possible match that seems not quite right. 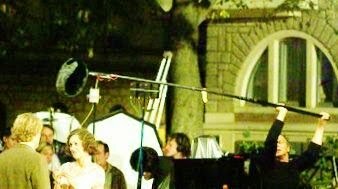 The archway windows in the location shot look similar to the archway windows we saw in the Place Dauphine, but there is a tree in the location shot that is missing in the photo we took - and there are other mismatches as well. So our quest made some progress but I won't pretend we got very far. The main thing is, we stayed outside, got some exercise, and had fun. The Place Dauphine was definitely one of the shooting areas and so was one of the areas on the banks of the Seine. However, we did not find precise locations. Dear reader, here is your chance to participate in a crowd sourcing experiment. See if you can fill in some locations either by going to Paris this summer or (less expensively) going to Google Maps. Type into the Google box "Ile de la Cit�", for example, and then click on Maps, and then on the orange Pillsbury Doughboy icon on the upper left. Post your discoveries as a comment on the link below the title at top. If we get enough of these, it will make a guide for Woody Allen fans visiting Paris.